I was working at my desk when a caller, seemingly casually, asked some general questions about Heifer International, where I was a nonprofit public relations director. I answered her questions and told a couple of anecdotes about families in Africa—people I had met personally—whose lives changed after Heifer had given them a cow. Absolutely, I said. I have a program officer from Cameroon with a master’s in international relations from Yale who is very good on camera. And we can have a cow accompany her if you like. Really? Really. It was not entirely luck. Preparation preceded that phone call. Knowing such a thing could happen, our little two-person nonprofit public relations team was always looking for stories and people who would be good on camera telling our stories. 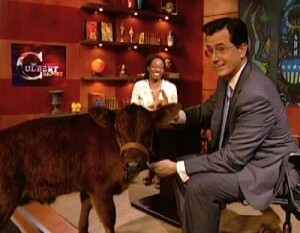 And we knew already where we could get a cow that could make a TV shot in New York City. Yes, we went that far. Reporters and producers today work fast. If you can’t respond immediately, they move on. Believe me, I’ve had that experience, too. But there is no crying in PR! Just get ready to hit that next pitch. 1. Am I ready? Do I have my goal clearly in sight? Your job is (a) to raise awareness of your organization and its cause, but more importantly, (b) to improve the climate for its fundraising. Don’t be confused. It is all about the Benjamins. 2. Do I understand my organization’s story? You can’t explain it if you don’t understand it yourself. Be able to put it in context with all the groups working on your issue. A good first step is to identify the programs person who knows the nuts and bolts of the organization. Become a journalist investigating your own organization, finding the people who can tell your story in a way the media will be interested in following. The most effective stories are the first-person accounts of the people your group has helped. Be able to immediately connect reporters to them. This is the hardest but most rewarding work you can do. Reporters used to find these stories themselves; now they just don’t have the time. So know your organization inside-out, how it works, what its impact is. Paint a picture of the problem, and then be in position to get individuals who represent the emotional heart of the work to speak to journalists. 3. What is my group’s ROI? If your group’s overhead (percent spent on fundraising and management, but not program) is 3-10 percent, your job is to shout it from the rooftops. If it’s 25 or 35 percent, your goal in nonprofit public relations is to be able to explain such high overhead so that it makes sense to an average listener. Or start looking for a new job. Some groups do require higher overhead. And, internally, you must explain to management how a low rate of return makes your organization a hard sell. Be aware that this is a question you will have to answer every time a journalist is interested in doing a story about you, whether they mention it in their reporting or not. 4. Is the organization’s mark effective? Do you have a recognized brand? Is the brand design good? Is it iconic or just confusing? Do you have a bunch of little brands that keep getting in the way of your big mark? It’s your banner. It has to be solid. Do you have a good enough eye to judge? Do you need to enlist a designer to critique it for you? You must be able to articulate (for people who may not have a strong visual sense) why the current mark is weak and what is needed to make it better. The number one characteristic of a mark is to represent strength. If it’s weak, can you redesign/tweak it into a solid mark? Be sure you do that before you make your nonprofit more famous. Or you’ll be stuck with it. 5. What are my key message points? And especially, what is the one thing you wish everyone knew about your organization? Say it every time you are on the air or in print. It’s impossible to overdo. Share your key message points with everyone who works for the organization. 6. Do I have a story list? Editors use story lists—a “budget” in newsroom parlance. You need one too. Often, reporters or producers will come out of their morning planning meeting looking for a story, and will call you and hope to be videotaping that story a couple of hours later. Or less if you can do it. So develop a list of agencies, people, locations—story ideas that you can draw on instantly, with addresses, phone numbers and any other information needed to help a reporter track down people working on your cause and get them on-air in a short period of time. Write a blurb for each story and refer to this list if a producer or reporter calls. And be ready to call the media to pitch those stories when a national story related to your cause makes news. 7. Do I have camera-ready spokespeople? When you bring a journalist to interview your staff people, clients and donors, you should know (a) what they are going to say, and (b) how well they can tell your story. This means making sure your spokesperson dresses and acts in a reasonable fashion, is comfortable in front of a camera, speaks clearly, uses complete sentences, doesn’t bob and weave (literally or figuratively), pauses frequently to allow editing, and won’t misrepresent your cause. (None of this applies to real people your group helps; the media wants them completely unfiltered.) Remind your spokesperson that, unless the segment is live, they can stop for any reason—lost a train of thought, got to the middle of a run-on sentence, started drifting from the message—and say, “Let me try that again.” Journalists are all familiar with retakes and editing. You sacrifice a little spontaneity but it’s usually better than misrepresenting a fact. 8. Can I help the media organize their story? Journalists hate it when they feel a PR person is trying to control them, but they appreciate intelligent suggestions about the set, props, logistics and storytelling. It’s best if they aren’t even aware they’re following your direction. Reporters are not stupid, but you have much more time to think about the story than they do, and you know it more intimately. If you come up with a better plan, they’ll use your idea. Try to think like a director or producer of a TV segment. Think movement, think action, think props—TV loves props. You can say, “You could ask this . . .” and “then you could do this.” If your suggestion improves their story, gets it beyond a “talking head,” they’ll do it. 9. Is my website up to speed? You need a website that reformats itself for tablets and phones, where much web traffic is moving. You should be able to edit/post in real time from a tablet or smart phone. Keep the website simple enough that you can keep up with content. Use Google analytics and other tracking tools to see how well you are reaching your audience. Metrics will help you persuade your organization to value your work. 10. Do we use social media effectively? Post frequently to Facebook, and set it up so a tweet goes out automatically with every Facebook post. See which other social media sites make sense for your audience—Flickr, Pinterest? Digg? InstaGram? But don’t overextend, don’t start something you can’t manage. 11. Bonus question: Am I prepared for a crisis? Are you prepared to defend your organization in a crisis? This is not disaster reporting. We are talking about when something bad happens within your organization—a financial scandal, employee misbehavior, a program failure. You will really earn your paycheck if you can marshal the facts and get your organization to be upfront from the beginning of the discovery of a crisis and get it over with and out of the way. Remember, more than one million nonprofit organizations in the U.S. are competing for media attention. By taking care of the basics you will put yourself ahead of the game. Bonus Video. For the leader who’s getting ready for an interview: The Esquire Guy’s Guide to Media Interviews. Ray White is a journalist, public relations expert and the creator of the cartoon strip Shelby. Photo: Elizabeth Bintliff on The Colbert Report.